Excellent tire for bike which I use to stay in shape. Ride 50 miles a month. Replaced the same tires I had which lasted 2500 miles. First 500 miles and zero flats. So far very good! I ride about 150-200 miles per week at racetraining speeds. 17.5-20 mph. I ride in Southern California and there are tons of thorns and nasty things on the road. I was getting flats often. Switched from Hutchinson, to Continental to These tires. I bought cheapo tires from REI and felt the terrible rolling resistance. I can feel when a tire is holding me back. it is kind of like riding through water or on a carpet or something like that. These feel as good as my GP 4000, my sale price was 9 dollars and no flats in 2 months and have ridden over glass, thorns. Not bad. Rolling resistance is good. I use 120 psi and these are the metal beads. Seem awesome to me. I bought 6.
i ride about 10000 miles per year and these are my tires of choice. I get 3-4000 miles on each rear and about 6-8000 miles on the front tires. strictly road riding. price to mileage can't be beat. with the kind of mileage I do, I can't afford a tire that wears out after 1000 miles - it would be almost cheaper to drive!! This is a pretty solid training tire so far. 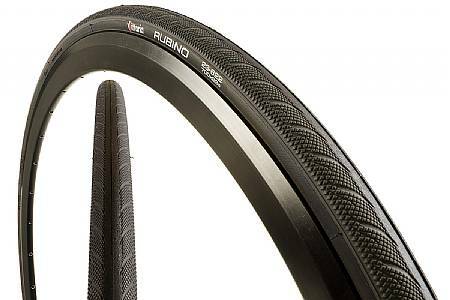 I have previously ridden the Rubino Pro 3's (slick) and they were great until about 3,000 miles when they became extremely flat-prone, so I decided to gamble on these since they were so inexpensive. So far they've been solid - 0 flats in close to 1,000 miles. The tire itself doesn't show any of the cuts that the Pro 3's had after the same distance, although that could be due to the slick tread on the Pro 3's. I would give these 5 stars if they didn't feel so heavy. Was looking for road tires for my cross bike. These have worked out great. Have had other rubinos and like how long they last. Gerat tire value for the price. Bought 28c tires for my Specialized Tarmac and love the feel. These tires are comfortable for tires with only 60 TPI and provide good grip in wet and dry conditions. So far I have only 500 miles on them but they seem to be holding up well. Unfortunately my rear tire received a nail puncture on an early ride however, once the nail was removed I could not locate the hole. Has not seemed to affect the reliability one bit. I will be getting more of these tires when the time comes. Great value, love the 28c width, they really absorb the rough roads from last winter. Love these tires! I am 8 years car free and bike daily. They corner beautifully and have yet to allow a puncture. I got black because it was available in my size but LOVE the color options. I bought a set of these tires three years ago and they have held up to 1200 miles plus each year. I just replaced them this year. They are a good durable tire that has taken a lot of abuse from me. I've tried other brands and they only last a season. Fast, convenient service. Product was exactly as described. Great price! Clydesdale here, with strong set of legs. These tires are amazing. Very flat and cut resistant. I'm riding on them from pavement, city streets, crushed stone streets and to unpaved, loos gravel and bumpy rural roads. They are lasting LOOKING GOOD/SAFE anywhere between 2000 - 3000 miles. I could keep them for another thousand or more, but I like to have fresh tires. The only problem, stated by others is cracking of sidewalls. Vittoria rep told m to keep it little over max PSI pressure to prevent these cracks from forming. May not work for all though. These are fast, quiet, easy to put on, and they also look good. Vittoria Rubino is THE BEST VALUE on the market. Great price! Hope they last. A well all around tire, it is my third set, lasts long, and feels secure. I do hills a lot and the tire feels good and safe downhill. It is a little heavier that some others I used, but that means spending more money, and this is affordable to me, specially as much as I ride and go through tires. Got the red ones to match my frame. They look great on the bike. Been riding them 8milesday on surface streets for a month or two and there's no visible wear. I think I got two years out of these. Not more than 1500 miles. First year they were kept in a shed in Ithaca New York and experienced temperatures ranging from -15f to 102 f. Second year was in San Diego with much more enjoyable year round climate. I'm a little disappointed in the overall miles- My front tire is getting thin and my rear tire popped from a direct hit by a tiny rock. I was hoping to get 2000 miles out of them and would have patched, but the rear tire looks thin enough that it's going to start losing out to sharp objects very consistently now. It has developed cracks along the sides of the tire (non-contact area of the tire) but these have not been a problem for me and weren't the cause of me replacing the tires. Two years is what I expected but 1500 miles is a little short for a lifespan. Overall I'm incredibly pleased and feel that the tires handled themselves very well for as long as they were in use. [$] bucks for 2 years and 1500 miles is a win by my standards.